Water exercise is an excellent way for everyone to improve fitness, flexibility, strength and even weight loss. Individuals with neurological problems find it difficult to move against gravity because of muscle weakness, increased tone (spasticity) or poor balance. In the water, with a good floatation device, the effects of gravity are virtually eliminated. The result is an improved pattern of movement. This water program provides basic instruction for deep water jogging and gait training. Read posts about water exercise. The first goal of a water exercise program is to increase flexibility and cardiovascular fitness. Each water session will start with an aerobic warm-up portion. Use an appropriate flotation device or water walking or jogging in the deep end of the pool. It may take a few sessions to feel comfortable in the water. Start with an easy walking motion and gradually move forward to an easy running motion. The ideal position is upright, leaning slightly forward, using the same motion of arms and legs as with running. Hands may be fisted or cupped. Do not try to pull the water towards you, just move arms forward and back. 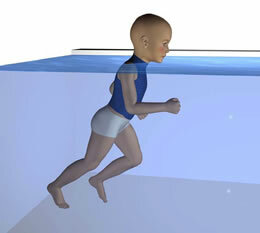 If you are using deep water walking/jogging as an aid to gait training use Position A. Start with 5 to 10 minutes of water jogging in the Wet Vest. Work this up to 30 minutes of continuous movement over the first month. Once you are at 30 minutes of aerobic conditioning, increase the work by increasing the speed and challenge of the activity. Younger children will get the same workout by running races about the pool, retrieving objects, or doing timed races from one side to the other. This exercise gives overall benefits for cardiovascular fitness, balance, strength and ultimately endurance. If the pool you have available is shallow, Position B may be used. This is half way between running and swimming. You will move faster in this position, but there is less water resistance and thus less exercise benefit. A. Start at side of pool in chest deep water, arms extended holding Sports Therapy Barbell in both hands on the surface of the water. B. Walk across the shallow end of the pool, keeping the Barbell on the surface of the water. At first, you may need the Barbell steadied by a helper. C. Walk backwards across the pool to the start position. This is one repetition. Hi, do you suggest infants participate in aquatic therapy? If so, at what age do you recommend they start? I would check with your physician first and the contact a baby swim group for help. 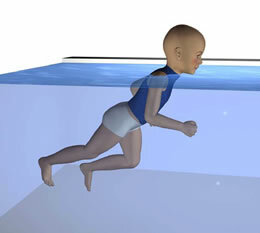 Any of the infant floatation devices can be used with adult supervision to give the baby the ability to move without gravity. We have a baby with birth asphyxia. MRI shows diffused brain damage.the motor activity is impaired.now she is 18 months old cannot crawl or sit.and cannot talk.cognitive functions are good. What treatment do you advice? She needs to be in treatment with a good pediatric physiotherapist for a start. She is a bit young from water exercise, but a trunk compressive garment may help with the sitting and crawling.http://www.karenpapemd.com/good-enough-is-not-good-enough-any-more-function-follows-form-in-cerebral-palsy/ since she is not talking, a hearing test would also be advised.